JUNEAU, Alaska – The Coast Guard along with multiple agencies and volunteers continue the search for an overdue aircraft with three people aboard 20 miles west of Kake, Alaska, Wednesday. The crew of the Coast Guard Cutter Anacapa and a Coast Guard Air Station Sitka MH-60 Jayhawk helicopter crew continue the search, along with a Juneau-based Alaska Army National Guard UH-60 rescue helicopter. The crew of the Coast Guard Cutter Bailey Barco is en route to the search area. Coast Guard Sector Juneau watchstanders received notification from Sitka Flight Services that a Guardian King Air 200 medical life flight was expected to land in Kake at 6:19 p.m. Tuesday, however, the aircraft never landed. The aircraft departed from Anchorage. Watchstanders directed the launch of the Coast Guard Cutter Anacapa crew to conduct the search near the last known position of the aircraft. Several good Samaritan vessels assisted in the search Tuesday evening. The electronic locating transmitter is not broadcasting for the overdue aircraft. Weather in the area is reported as rain/snow mix with overcast skies, 7 mph winds and an air temperature of 39 degrees. The water temperature is 42 degrees with 1-3 ft. swells. 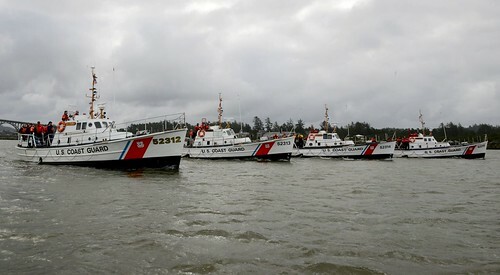 The Coast Guard Cutter Anacapa is homeported in Petersburg, and the Coast Guard Cutter Bailey Barco is homeported in Ketchikan, Alaska.